Soul Electronics Blade: true wireless buds with 'world’s first' fitness features | What Hi-Fi? Soul Electronics is preparing to launch the world’s first true wireless earbuds with both a built-in heart rate monitor and AI voice coaching, the latter of which provides real-time feedback on your running form. 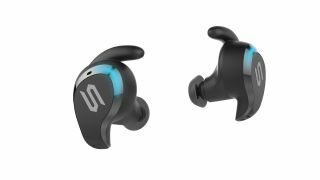 The Blades are new versions of the Blade in-ears the company launched last year, similarly aimed at fitness fanatics that would benefit from being analysed (the Blades can measure speed, distance, cadence, step length, step width and head tilt angle) and guided through their runs. As is more customary with sport headphones, the Blades are weatherproof (to iPX7), come with an app that logs training data (Soul Electronics Soul Fit), and feature an ear hook design for a secure, exercise-friendly fit. The true wireless buds offer a reasonable six-hour battery life and will be available later this year for $250/an estimated £200. There's no doubting the potential of the Blade's usefulness as running headphones (providing their analysis works!). We simply hope they'll fare better than the Soul Electronics Run Free Pro Bios we recently tested, and are more akin to the price-per-pound performance offered by the company's Flex headphones.